In 2011 a proposal for a major airport in the Arial Beel wetlands was cancelled following protests by farmers and fisherfolk . Potential alternative sites would displace people and a recent proposal to locate the project in Char Janajat triggered protest. In August 2010 the government of Bangladesh endorsed construction of a major new international airport, called Bangabandhu Sheikh Mujib International Airport, stating that around 2,428 hectares of land would be required. The Civil Aviation Authority of Bangladesh (CAAB) shortlisted three sites for the airport: Arial Beel in Munshiganj, Trishal in Mymensingh, and Bhuapur in Tangail. Initially, Trishal emerged as the favoured site, but because this would entail displacement of a large number of people, the government changed its mind. In the absence of a feasibility study or Environmental Impact Assessment (EIA) land in the Arial Beel was earmarked for the airport. To the south of the capital city of Dhaka, Arial Beel is the third largest wetland in Bangladesh covering an area of 136 square kilometres. The land requirement for the project had more than quadrupled, to 10,117 hectares, as the plan now included a ‘satellite city’. Announcement of the Arial Beel site immediately triggered heated debate and stiff resistance to the threat of eradicating the wetlands which would impact on the farming and fishing livelihoods of thousands of local people. The wetlands contain many waterbodies which irrigate fields year-round, supporting high yields of rice and many types of vegetables. Environmentalists raised the risk to biodiversity including destruction of the natural breeding ground for many varieties of small fish. There were concerns that the wetland site was unsuitable for an airport and that the government appeared to be disregarding its own National Water Policy. The leading opposition party, Bangladesh Nationalist Party (BNP), lent support to the anti-airport campaign. 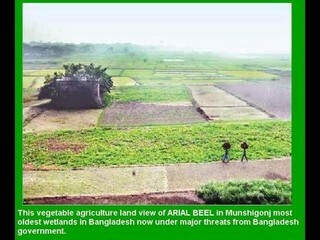 Bloggers opposing the takeover of Arial Beel for the proposed airport questioned the necessity of a new airport, saying that existing airports, including Shahajalal Airport, the largest in Bangladesh, were not operating a full capacity and could be upgraded to handle future traffic increases. 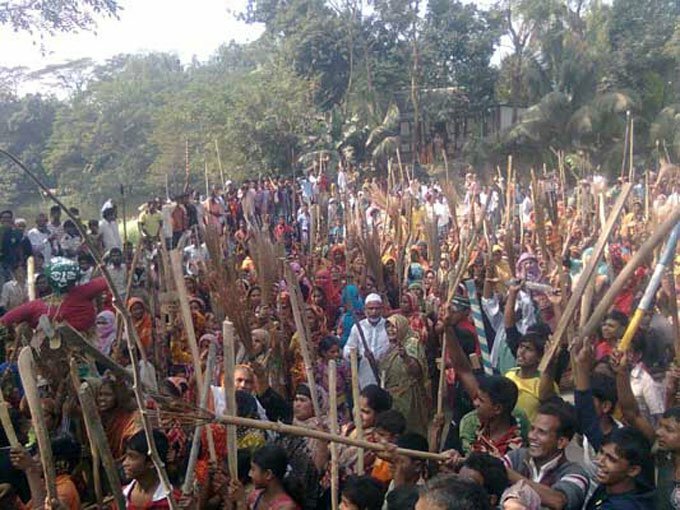 Protests that had begun upon announcement of the plan to construct an airport Arial Beel escalated. On 26th January 2011 police attempted to prevent supporters of the anti-airport campaign, Arial Beel Rakkha Committee (Arial Beel Protection Committee), from joining a protest rally in Muktangan. A clash between police and demonstrators ensued which resulted in at least 30 people suffering injuries and 20 vehicles and 30 shops were vandalised. 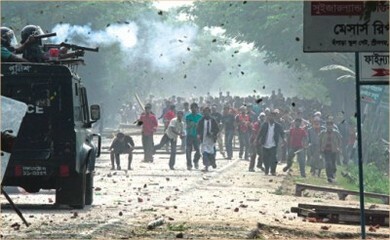 Cases were filed against 4,026 people over the clashes between law enforcement officers and protesters, and in response the Arial Beel Rakkha Committee announced that another protest would be held and that there would be a blockade on the Dhaka-Mawa highway. 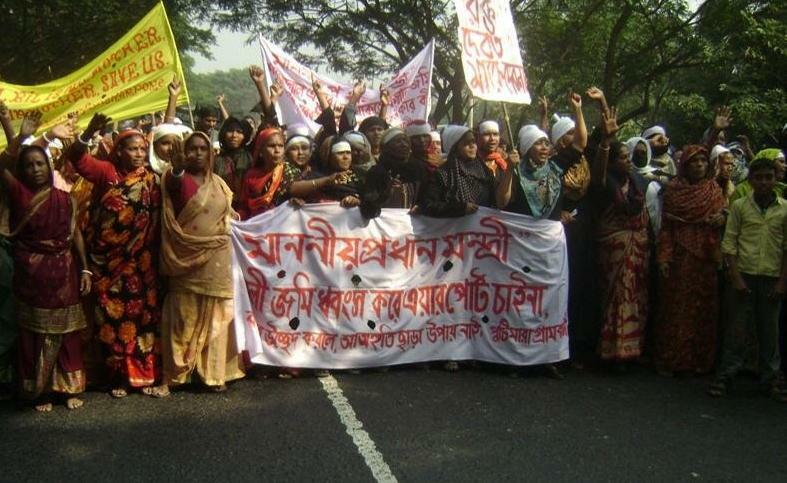 Bangladesh human rights organization Odhikar reported that the procession organized by Arial Beel Rakkha Committee was disrupted by police who took away their banners and imposed a blockage. Protesters then attempted to make a human chain but police chased them away. Arial Beel Rakkha Committee said their protest was peaceful and three protesters received bullet injuries. The subsequent protest and road blockade took place on 31st January 2011. A policeman was killed and approximately 100 people, police and protesters and observers, were injured in clashes between police and protesters. By 11am on the day of the blockade more than 30,000 people had gathered, many of them carrying bamboo and wooden sticks. Some of the demonstrators blocked the road with logs, and tyres and firewood which they set fire to, others scattered over a wider area. A group of people torched a police outpost. Two journalists were beaten and one of their motorcycles was set alight. Police fired rubber bullets and hurled teargas canisters to disperse the protesters. A photographer from Priyo News reported that a photographer for the Naya Diganta newspaper was shot in his leg. It was alleged that a number of police ransacked 50 houses and beat up the inhabitants in reprisal for the killing of their colleague. The Arial Beel Rakkha Committee issued a press release condemning the attacks on police and journalists. Photographs published in the Daily Star showed demonstrators setting fire to a journalist’s motorcycle, blocking the highway with logs, people throwing stones at police and an injured police officer. The policeman who was killed was sub-inspector Matior Rahman, 53 years old. He was declared dead by doctors when he was rushed to Mitford Hospital with critical injuries. On 2nd February 2011 Prime Minister Sheikh Hasina said no airport would be built in Arial Beel against the will of the people of the area. Locals celebrated, making victory signs. But tensions remained high in communities participating in the protests. The day after the no airport announcement male members of almost all the families, who had fled their homes to avoid arrest, had yet to return. Prime Minister Sheikh Hasina remained insistent on the necessity of a new international airport, stating that in regard to government plans to develop beach tourism in Cox’s Bazaar, Chittagong and Kuakata it would be needed to bring in international tourists. She announced that the site would be shifted to another location following a feasibility study, south of the Padma River if necessary. Journalist Shykh Seraj reported on a visit to Arial Beel in 2013, where he found wetlands that could have been lost to the airport supporting plentiful fish of many species and snails that were sent away on trawlers to be used as food for shrimp farms. Rice harvests were good and there was bountiful vegetable production including pumpkins, bottle gourds. He talked with farmers who had defended their land and livelihoods from the airport project and were determined to continue to do so, becoming distressed when recalling the threat that the airport had posed and their struggle against it. The government revived the Bangabandhu Airport project in 2014. After consideration of another eight possible sites, a potential new location, Char Janajat, was under consideration, for an airport with three 4.4 kilometre runways. The proposed site was considerably smaller than the Arial Beel plan, at 3,237 hectares. In 2016-17 Japanese firm Nippon Koei Ltd conducted a feasibility study which selected Char Janajat and two other locations as potential sites. But in December 2017 concerns were expressed by local politicians. The government was having great difficulties proceeding with the Char Janajat site because of protests by local residents. There was even opposition from within the Awami League, Bangladesh’s governing party, with a number of representatives expressing resentment during a discussion at the Prime Minister’s Office on 29th October 2017, saying that an airport in this location would require a massive relocation of residents. Char Janajat representatives said they were afraid of a repetition of the Arial Beel incident. Another feasibility study was conducted and another study called for. The Civil Aviation and Tourism Ministry said the consultancy firm commissioned to provide a detailed report on the number of people to be relocated and the costs of resettlement and land acquisition was anticipated to complete the report soon. In January 2018 uncertainty was hanging over the Bangabandhu Airport project. Along with the problems of displacement of people for the airport the proposed Char Janajat site is an island within the Padma and Arialkha river basin areas, leading to doubts over the feasibility of constructing such a facility on river island soil. Project Details Plans for Bangabandhu Sheikh Mujib International Airport (Bangabandhu Airport), named after Sheikh Mujibur Rahman, commonly known as Bangabandhu, the country's former president, were endorsed by the Bangladesh government in 2010. In 2011 the estimated project cost was Tk 50,000 Crores USD5.96 billion. Land in Arial Beel wetlands was earmarked but an airport in this location was cancelled in 2011 following major protests. In August 2014 the government revived the Bangabandhu Airport project and began considering alternative possible sites. Japanese firm Nippon Koei Ltd was appointed by the government to conduct a feasibility study which, in 2017, selected Char Janajat and two other locations as potential sites. According to aviation consultancy Centre for Aviation (CAPA) Bangabandhu Airport will feature three 4,420 metre runways on a site spanning 3,237 hectares. Bangabandhu Airport could be Bangladesh’s main hub airport and the project is expected to be complete by 2025 at an estimated cost of USD6.4 billion. The proposal for a new airport, called Bangabandhu Sheikh Mujib International Airport, in Arial Beel was cancelled due to protests, but new sites for the airport are under consideration. Why? Explain briefly. Farmers and fisherfolk depending upon the Arial Beel wetlands organized a campaign which was successful in achieving cancellation of the proposed airport and 'satellite city'. Unfortunately violence at a major protest resulted in a policemen being killed, and about 100 people, police, protestors and observers, suffering injuries. The government has since revived the project and potential sites that have been identified would all involve displacement of people. 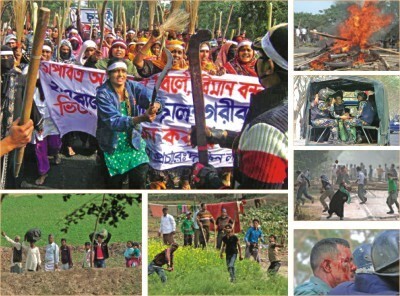 Consideration of a site in Char Janajat triggered protests and fears of a repeat of the conflict over the proposed location of the new airport in Arial Beel.